Honda Engines expanded its mini four-stroke lineup with the Honda GX50. Available now, the Honda GX50 engine features a maximum output of 1.97 hp and weight of 10.4 pounds. The power-to-weight ratio of the Honda GX50 is equal to a comparable two-stroke engine; however, the GX50 produces lower emissions while being more fuel efficient and complies with the most stringent environmental regulations, including EPA Phase III/CARB Tier III/EU Stage 5, the company said. 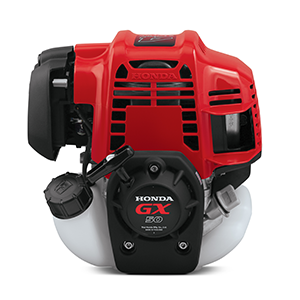 The Honda GX50 engine is easy to start with an automatic decompressor reducing the pulling force on the recoil rope. It also features a condensed, compact design with long, vertical lines, and its attachments and connectors share an integrated, slanted shape. Additionally, the GX50 is 360-degree inclinable, allowing it to be operated and stored in any position. Further, the engine integrates an innovative bridge guard design, a wide, scratch-resistant area with protruding edges that provides stability and serves to protect the engine cowling in upside down positions during maintenance intervals. The Honda GX50 is available nationwide, and parts and service are widely available through the Honda National Dealer Network. For commercial and rental use, all models carry a one-year warranty.